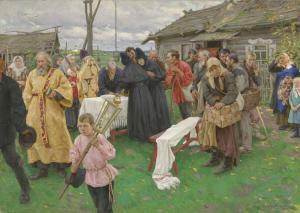 Find artworks, auction results, sale prices and pictures of Nikolai Vasilievich Kharitonov at auctions worldwide. Nikolai Kharitonov (1880-1944) Country gathering signed in Cyrillic and dated 'N. Kharitonov/14.' 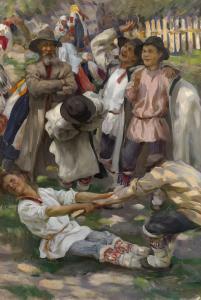 (lower right) oil on canvas 78¼ x 109 3/8 in. 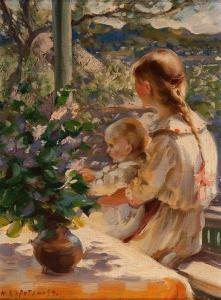 (199.5 x 278 cm.) 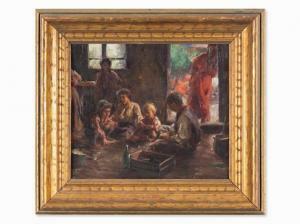 Painted in 1914 Provenance Anonymous sale; Christie\’s, New York, 31 October 1990, lot 41. Acquired at the above sale by the father of the present owner. Oil on canvas, 124 by 84 cm. Authenticty of the work has been confirmed by the expert D.Volyak.